Yep, it sure did cast a spell. I loved the imagery that she created. Ti - I did too! So beautiful. This book is on my list! It sounds great, and I love the cover. A.M.B - I do hope you'll read it! I'd love the hear your thoughts on it. I enjoyed but not near as much as you did. I was disappointed in the way it all ended. Staci - Now I'm dying to know what you didn't like about the ending! I'll e-mail you. I have an autographed copy from the author on my shelves at home and can't wait to read it. What have I been waiting for??? This was one of my favorite books of last year,and I am so glad that you and I both had the same opinion on it. It's really a great and very picturesque novel, and I felt so strongly for the characters. The scenery was amazingly detailed, and very highly conceptualized. Fantastic review today. I want to read this one again! Heather - I just wish I was better able to put into words what I loved about this book. I almost didn't read (well, listen) to it. My husband saw it on my audio wish list while I considered whether I wanted to read it or not. He decided to get it for me. Loved this one and have to agree that the love story worked very well. I think the way the reader gleans from the start that Marco and Celia are going to face pressure and problems makes them likeable, you never wonder whether they're good or not, they always are. I'd recommend the hardback if you're thinking of buying a paper copy, it's absolutely beautiful. 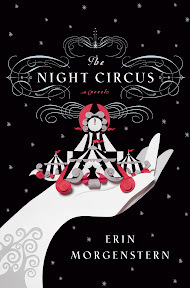 I LOVED the Night Circus. This is one of my faveorite books I have read this year. Hillary - You too! It's such an amazing book. A book that I've heard lots about. It seems to have so many different covers. Petty Witter - Does it? I will have to go look! I've only seen the one. I am glad you really liked this book. I loved it! Jennifer - I like that description, "absolute magic"! So true. You've reminded me that I need to read Strange and Norrell!! It's been on my shelf for YEARS (since the initial blogger buzz). I'm so glad you enjoyed this one and I agree that the imagery is quite rich--I'm grateful that I read this one. I've actually heard mixed things about the audio--even though I've heard Jim Dale is a fantastic narrator--so I'm glad it worked for you! Trish - My husband counts Clarke's book as one of his all time favorites. Jonathan Strange and Mr. Norrell really is a good book. I know quite a few people were put off by its length though. I've been wanting to read this one, but I've been sort of on the fence about it. Your enthusiastic recommendation makes me definitely want to get to it! Amy - It is so good! I wasn't sure I wanted to read it after all the hype, but am glad I took a chance on it. I loved this book, too! So much so that I wanted to re-read it right away, the descriptions were that good. Anna - I hope to actually read the written version soonish. Maybe early next year. Wow! A favorite of all time? I have this one on my shelf and apparently I am missing out. It's really the size that's scaring me off right now. Have a great Thanksgiving. Stacy - Is it a big book? I never noticed when I was listening to it. I really do need to get myself a paper copy! I really fell into this one and loved it, too. It's so out of my usual read but maybe I liked it because it, as you say, has that fairy tale feel to it. Lisa - I think the fairy tale aspect is what really drew me in. Melody - Do read it! Hurry so we can talk about it! I really need to read this. I have it on mt tbr but just never quite get there. Caspette - I know how that goes!